For this act of gallantry at the Battle of Kangla Tongbi, Major Boyd was awarded the Military Cross (MC), Conductor Panken, the Military Medal (MM) and Hav/ Clerk Store Basant Singh, the Indian Distinguished Service Medal (IDSM). The Kangla Tongbi War Memorial is a mute testimony to this battle and the unflinching devotion to duty of the Ordnance personnel of 221 AOD, 19 of whom made the supreme sacrifice. It conveys to the world at large that Ordnance personnel, apart from being professional logisticians, are second to none in combat, being equally proficient soldiers, should the occasion demand. As it commemorate the Platinum Jubilee of this hard-fought battle, the spirit of Kangla Tongbi lives eternally in the hearts of all Army Ordnance Corps personnel of the Indian Army and continues to be source of inspiration for all ranks. 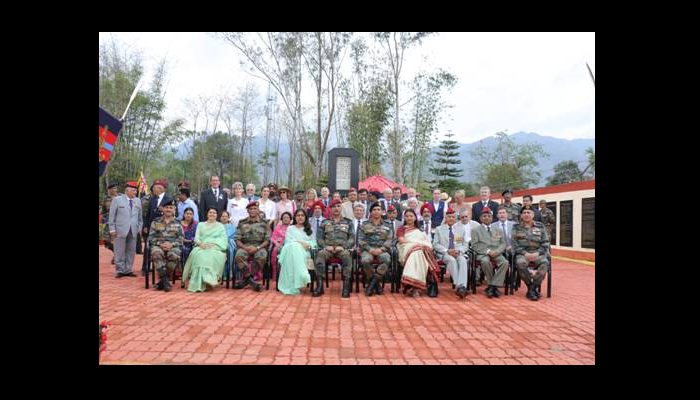 Apart from laying wreath at Kangla Tongbi War Memorial, the DGOS & Senior Colonel Commandant, senior dignitaries and next of kin of the Britishers and descendants of Indian Martyrs visited the Kangla Tongbi Children’s Home. To commemorate the occasion and as a matter of charity, the inmates were presented with gifts during the interaction with them.